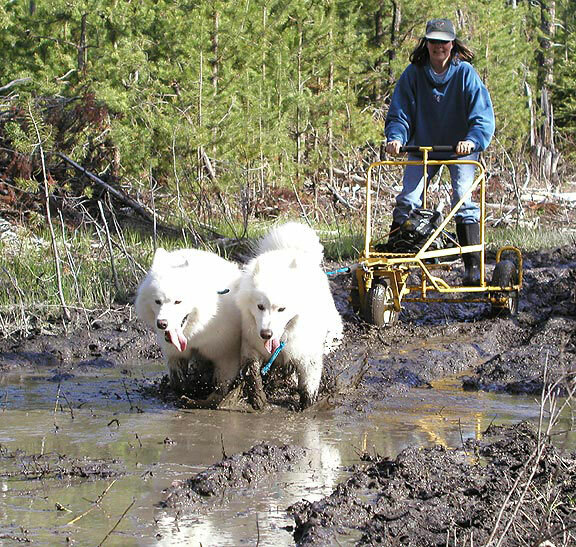 We attended the West Coast Mushing Boot Camp with Jamie Nelson and Ann Stead. These intense three-day clinics are intended to improve training techniques for mushers and build communications skills with their teams. Lightning (on right) and Nimbus (on left) comprised the smallest team in our group which included other Samoyed teams, Siberian Huskys, Alaskan Malamutes, Alaskan Huskys, and even a Great Dane! Our Boot Camp was hosted by the Crystalwood Lodge near Klamath Falls, Oregon. Their dirt trail system made up our lovely training grounds. Several challenging sections included large meadows which the teams had to circumnavigate without benefit of a visible trail, stream crossings, and The Bog (shown here). The teams pulled through about 4,000 feet of muck over the three day event, which was a workout considering how sloppy and deep it was! I was very proud of how well our kids did at Boot Camp. They did everything I asked of them and then some. We picked up invaluable advise and feedback, and working with other mushers was a special treat. We are in the process of updating our blog. There is a lot of data to migrate over from our old website, and much news that has yet to be online. Subscribe to our RSS Feed (see below) if you would like to keep up with our updates.